I became a grandma last weekend!! I cannot wait to see my little grandson, who is a bit of a distance away. It should by the end of the month for sure. He looks a lot like his Daddy and his Mom did a great job delivering him. He is in very good hands. In honor of my grandsons I am posting today about my newest craze, making baby clothes, baby quilts and Babyville cloth diaper covers. .
My husband bought me a White sewing machine 25 years ago, when we had two of our kids. The first thing I sewed was a little red and white print cotton romper outfit for my daughter. I taught myself to sew when my three kids were little and had a blast. The first thing I sewed was a little red and white print cotton romper for my daughter. I went over to my friend Kathy’s and she showed me, step by step how to cut out the pattern and sew it together. I could not believe I actually did it, as I had a sewing nightmare in 7th grade home ec. class and was scared of the sewing machine. Later, I discovered the nightmare could have been relieved if someone would have taken the time to show me how to thread the machine! From my White machine came all kinds of little outfits for the kids. It gave me a real sense of accomplishment to be able to sew for them. In the 90’s, my hubby got me a Singer overlock machine. I also got another machine, an Elna. I enjoyed it so much. The sewing machine started slowing down, however, as the kids got older and didn’t want handmade clothes. I was absorbed homeschooling them and so my hobby went on the back burner. I started working in the early 2000’s and my jobs took too much time and energy. I was worn out at the end of my days with all the different jobs I worked over the years. The machines were stored away. I mistakenly put the Elna and the overlock in the unheated attic. Bad idea. When I learned I would be a grandma to not one but two little boys I wanted to start sewing again. I was nervous, though. What if I forgot everything? My first project was an easy tumbler quilt, and no worries, it all came back to me easily, even threading the machine! Quilting seemed daunting, but it actually was fun. My grandson’s quilt is uniquely his as I embroidered his initials on it and placed a Winnie Pooh patch in the middle. I had so much fun sewing the tumblers together. One day when I was in the fabric store picking out fabric for the quilt, I found out about Babyville cloth diaper covers. My other grandson will be wearing these. Babyville makes all the supplies you need to make stylish and versatile covers for your baby. I bought the guide book, Cloth Diapers Made Easy and so far have made 4 covers and about a half dozen soakers. 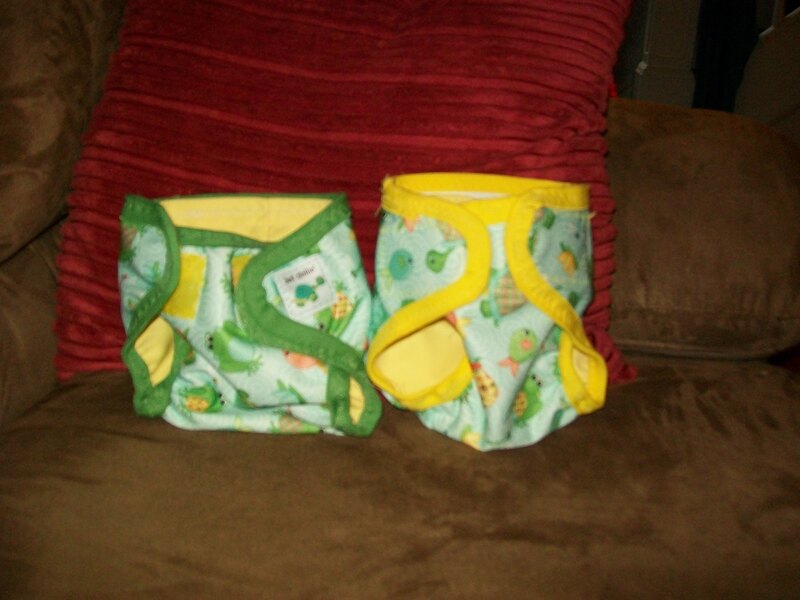 Included in the book is the pattern for the diapers and the soakers, all the way from newborn to large. (The soakers are placed inside the covers to absorb the wetness.) Babyville makes cute colorful PUL fabric for the covers. You can buy a little kit with cuts of three fabrics or you can buy it by the yard. They also have all the accessories you need as well: velcro, snaps, fold-over elastic, even cute little tags to sew on. I made the velcro ones so far. One of the ladies at Joann made covers for her kids and she told me a baby needs about 5-6 covers per day and about a dozen soakers.